To Cite: Farhadian N, Miresmaeili A, Mollabashi V. A Creative Spring Design to Force Erupt Labially Impacted Maxillary Canine Using Single Mini Implant, Iran J Ortho. 2014 ; 9(3):e4858. doi: 10.17795/ijo-3936. Introduction: Complications to force eruption of impacted teeth may arise from several reasons including ankylosis, dilaceration, and/or some barriers in the eruption pathway. Treatment time prolongation without obvious clinical progress gradually decreases the patient compliance. In this paper we present a non-conventional method to forced eruption of an impacted maxillary canine. 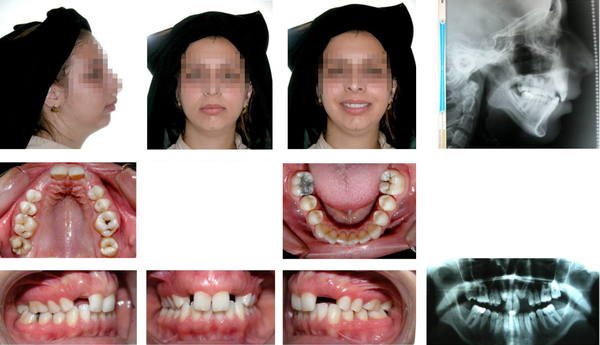 Case Presentation: A-21-year old girl presented with missing of teeth No 17, 12, 22, 27, 38, 37, 47, 48 and labially impaction of both maxillary canine was prepared for treatment through apically position flap for exposure of the both canines. Using standard edgewise 0.18 appliance and conventional elastic traction the right maxillary canine erupted to its normal position after about 18 months but the other tooth had not responded favorably to this technique. There was no signs of ankylosis, a titanium bone screw was placed in the labial cortical bone and mesial of the malposed canine. 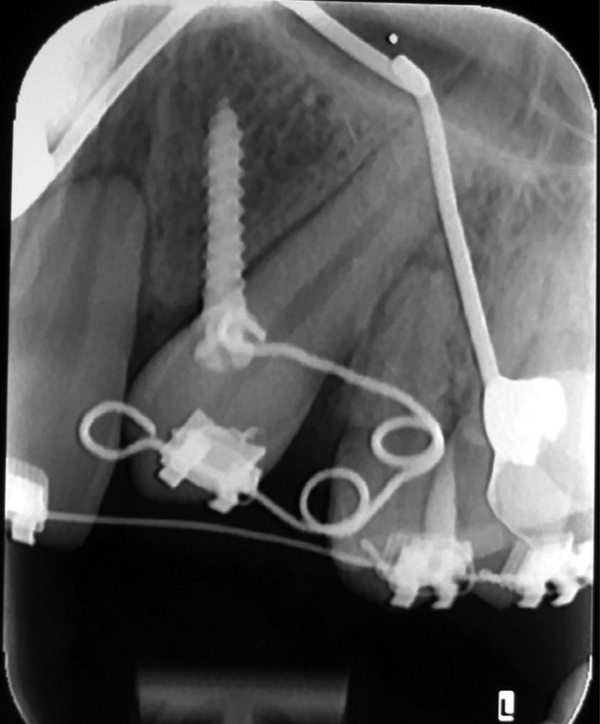 A spring is made of 0.017” × 0.025” SS wire with two helixes that delivered about 100 g force and 400 gr.mm activation moment to labial bracket on malposed canine crown. The force exerted on mini implant will be balanced with a force and moment on malposed tooth very similar to type IV Burston classification. After about 5 months the tooth had reached to its final occlusal position. Conclusions: The appliance used for this patient brought the impacted canine into the arch without any more force on the neighbor teeth. Two point contact of the spring arm by bending the wire over the head of the mini implant made it possible to apply buccolingual crown torque. Skeletal anchorage, which provides a nearly stationary base, has become a routine treatment adjunct for many kinds of tooth movement (5, 6). 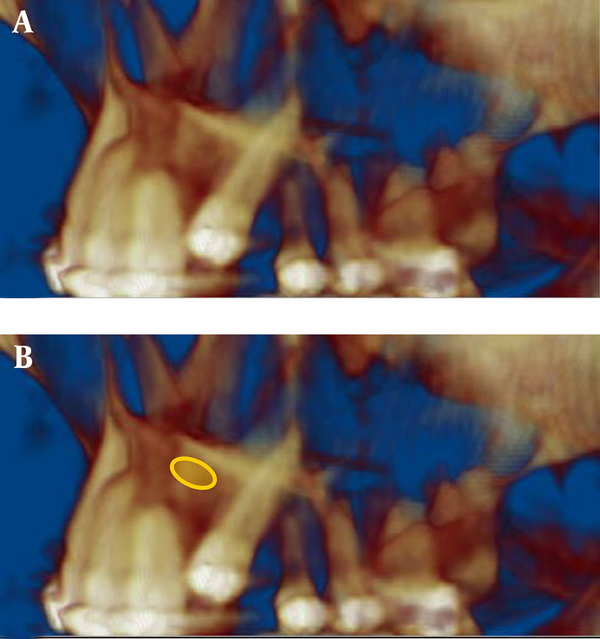 To erupt labialy impacted maxillary canine, a spring is made of 0.017” × 0.025” SS wire with two helixes that deliver about 100 g force and 400 gr.mm activation moment to labial bracket on malposed canine crown (Figure 1). The upper horizontal arm of the spring is inserted in the mini implant hole. When the other arm inserted in the bracket slot it produces a vertical force and a moment for mesial root movement. The force exerted on mini implant will be balanced with a force and moment on malposed tooth very similar to type IV Burston classification (7). To increase the moment the spring arm at bracket level could be bended in such a way that when it is placed into the bracket slot produce an additional pre-activation moment which produces a condition comparable to Type V Burston classification (Figure 2 A). This bend has little opposite moment on mini screw which could screw it in to the bone if had any effect at all (Figure 2 B). Such a bend could not work on the same situation on right maxillary canine because it can cause loosening of the mini implant. This spring design provides a force system with M/F > 4 for extrusion and mesial root movement instead of extrusion with uncontrolled and unpredictable root movement. Figure 2. A, preactivation bend; B, after putting the wire at bracket level. Mild bending at arrow could produce more momentum for root movement with mild effect on mini implant which is in the same direction of screwing it in to the bone. 4. Continuous force system instead of interrupted force by elastic traction. 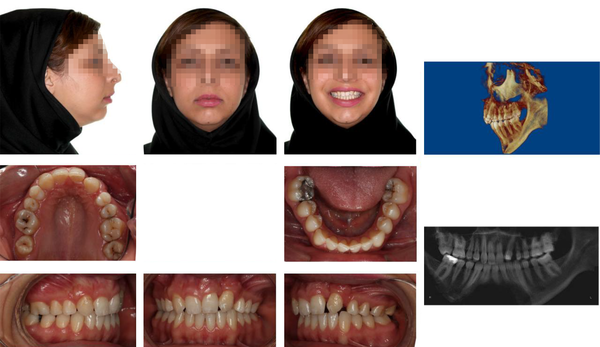 The patient was a 21-year-old girl presented with missing of teeth No 17, 12, 22, 27, 38, 37, 47, 48 and labially impaction of both maxillary canine (Figure 3). Apically position flap was used for exposure of the both canines. Using standard edgewise 0.18 appliance and forced eruption with conventional elastic traction the right maxillary canine erupted to its normal position after about 18 months but the other tooth had not responded favorably to this technique. Position and morphology of left impacted canine was determined by CBCT (Figure 4). Since oral surgeon found no ankylosis and the patient lost her compliance and adjacent teeth showed moderate resorption we had decided to continue the eruption using mini implant with our special designed spring (Figure 5). Accordingly a titanium bone screw with a hole in head (2 mm × 10 mm, Jail medical corporation, Seoul, Korea) was placed in the labial cortical bone and mesial of the malposed canine at an angle of about 60 degree to the bone surface. After about 5 months the tooth had reached to its final occlusal position. The mechanic was effective in bringing the tooth to normal occlusion by extrusion with mesial root movement (Figure 6). Figure 7 demonstrated the final result. A, apical dilacerations was placed in the lateral wall of the nasal cavity. B, The highlighted area shows the relation between nasal floor and root of the canine tooth like the ring around the Saturn. Mesial root movement need to remodel this dense cortical plate. Yellow circle shows the dilacerations. A, before and after movement. B, determination of center of rotation to show the effectiveness of applied moment. The major cause of being non-responsive to routine forced eruption in left maxillary canine were blocking of its crown by incisor root, close vicinity of its mid-root to premolar root and apical curvature toward the mesial, the same direction of required root movement. Moreover, not only the root of the impacted canine was placed in the lateral wall of the nasal cavity, it also passed through the nasal floor so these dense cortical plates resisted against translation of canine root through them (Figures 4 and 6). The single force as used for the right canine by elastic traction provides eruption and uncontrolled tipping with movement of crown and the root in opposite direction. 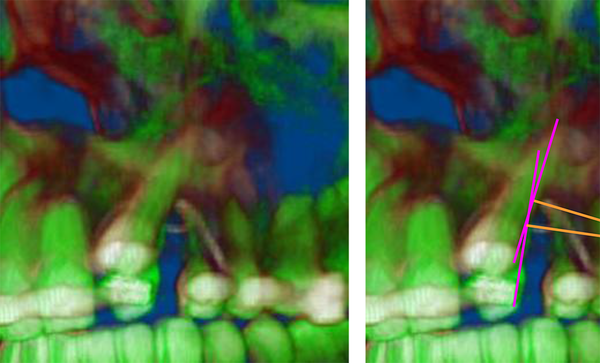 Dilaceration made tooth eruption parallel to the alveolar socket wall impossible and mesial root movement was restricted by surrounding dense cortical plates, so the easiest possible movement was pushing the canine toward the premolar root. The major advantage of this appliance was application of moment concomitant with vertical force and it was possible due to bracket placement in its normal position immediately after exposure of the canine crown. This provided controlled mesial root movement and eruption to normal position simultaneously. If there were no dilacerations and we need lighter force, TMA wires could be substituted for SS wire. They would have no need for reactivation and reducing the frequency of patient visits (8). The system can be applied at the start of treatment which could reduce treatment time. The appliance used for this patient brought the impacted canine into the arch without any more force on the neighbor teeth. Removal of fixed appliance also made the first premolar free to move away from the path of eruption. Two point contact of the spring arm by bending the wire over the head of the mini implant made it possible to apply bucolingual crown torque and movement by this spring (Figures 5 and 8). 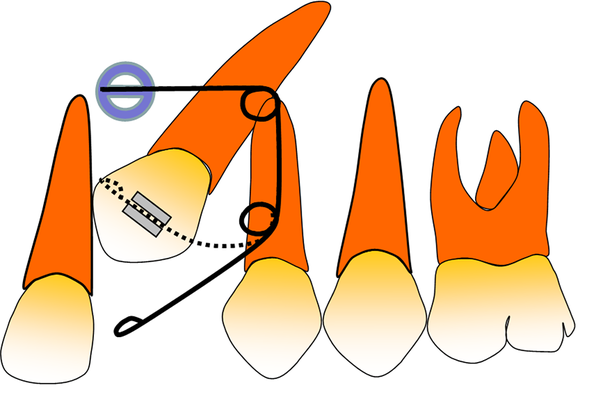 A, preactivation: buccal force and buccal crown torque were both placed on spring. B, one month after activation. Despite methods that used implant in palate for force eruption of impacted teeth, labial implant was not faced with masticatory forces from food on the edentulous ridge (9). Disadvantage of this spring design include: mucosal irritation on buccal side when there is no enough attached gingival (and poor oral hygiene), high failure rate in adolescent and limited space for mini implant placement between canine crown and incisor root. Authors’ Contributions: Nasrin Farhadian treated the case and designed the mechanotherapy. Amirfarhang Miresmaeili treated the case and designed the mechanotherapy, and also, he is the corresponding author. Vahid Mollabashi prepared the manuscript and figures.